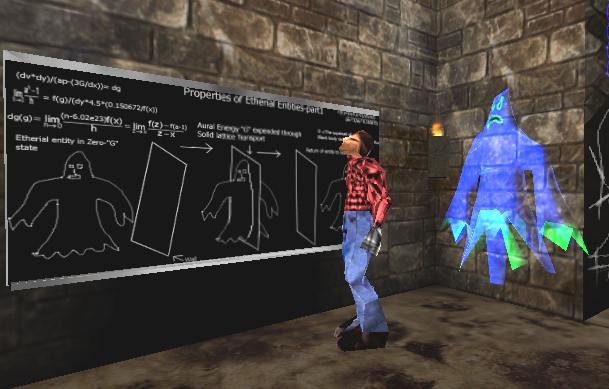 Using Unreal Tournament (UT), we are creating an adventure game where the player takes on the persona of a ghost-like energy creature trapped in a house. UT is an action game similar to Quake2 with an underlying engine that is extremely flexible. For just the cost of the game ($20), you get access to level editors for defining the environment, a scripting language (Unrealscript) for defining the physics of the world and the way objects in the world interact, and the ability to import your own objects into the game. 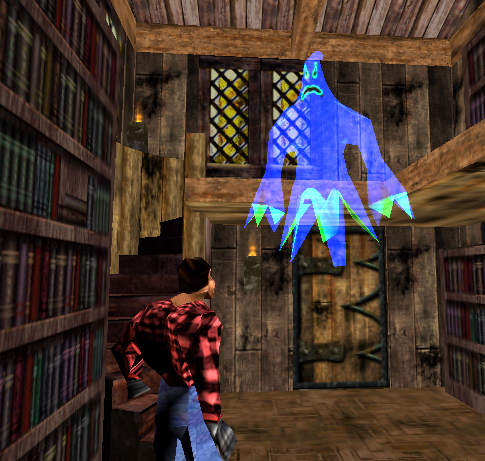 In our game, the human player's goal as the ghost is to escape the house and return home to an underground cavern. The ghost is severely limited in its ability to manipulate the environment. It can move or pick up light objects, such as a match or a piece of paper, but it can't move or manipulate heavy objects. Moreover, metal drains the ghost energy, so the ghost must avoid metal objects. These constraints force the player to entice, cajole, threaten, or frighten the AI characters into manipulating the objects in the world, which in turn forces us to develop AI characters that have enough intelligence to make these social manipulations possible and realistic. With the AI characters playing such a central role, they must have distinctive personalities in terms of their goals and reaction to the environment. For example, there will be the evil scientist who is immune to fear but is weak and easily fatigued by exertion or cold and wants to capture the ghost character, while there will also be a lost hitchhiker (we aren't trying to have the most original story ever) who is easily frightened by the ghost, but is physically strong and driven by curiosity. The game will push our research to integrate the knowledge-based, goal-oriented reasoning that we have concentrated in the past, with emotions, personality, and physical drives that have been used in simple, knowledge-lean agents in other systems. Our hope is that we inspire others to pursue human-level AI characters and new types of games that those characters make possible. Here are the people who have contributed to our research on AI and computer games over the years (in alphabetical order): Ben Bachelor (Unreal Interface), Nathan Benninghoff (Unreal 3D models), Syed Enam-Ur-Rehman (Haunt Bot), Brad Jones (SGIO, Unreal and Quake interfaces), Alex Kerfoot (Unreal script), John Laird (project management, game design, bot), Colin Lauber (Haunt Level Design), Brian Magerko (Sound), Jeff Sheiman (Unreal 3D models), Devvan Stokes (Haunt Level Design). A description of the Haunt 2 project. Mazin Assanie’s work on creating directable synthetic characters.